HP simplifies SANs by combining 8 Gb/s Fibre Channel performance with a complete SAN management system. Your future is protected today with an infrastructure capable of supporting emerging technologies at today's 4 Gb/s prices. The HP 8Gb SAN Connection software makes installing your first SAN (or your hundredth) easy. An entire SAN may now be deployed in minutes. SAN novices and seasoned experts will appreciate the simplicity and power of the included SAN Connection Manager (SCM) software. SCM works seamlessly with both HP P6000/EVA and HP P2000/MSA to quickly handle common cross-platform management and maintenance tasks as well as create LUNs. The 8Gb Simple SAN Connection Kit consists of the 8/20q 8 Gb/s switch, four 81Q HBAs, and SCM – along with all the cables, 8 Gb/s SFPs and documentation you need. The 8/20q switch and Connection Kit offer enterprise-class functionality and value. The future is within your reach today with state-of-the-art 8 Gb/s Fibre Channel technology offering the bandwidth today that you will need for support of emerging technologies. 8 Gb/s speed extends the useful life of your purchase. Migrate at your own pace. Powerful features such as Adaptive Trunking (optimizes fabric speed), drag-and-drop zoning, I/O StreamGuard (uninterrupted dataflow), automatic firmware notifications and downloads and non-disruptive upgrades give you the winning edge and help you get the most out of your SAN. No need to master separate interfaces to control HP switches, HBAs and storage. Configure, create LUNs and monitor them all from a convenient integrated single management interface. Up to 340 Gb/s aggregate performance in a single switch. Setting up your first SAN is now fast, easy and fool-proof. Eliminate the risk of expensive configuration errors with point-and-click wizards. Ensure full optimization and “best practices” with minimal training and expertise. Application-based wizard enables your SAN to be quickly and easily provisioned based on published best practices. Included is a Microsoft Exchange wizard sized for a variety of typical configurations as well as a custom template to create your own for fast deployment of other applications. 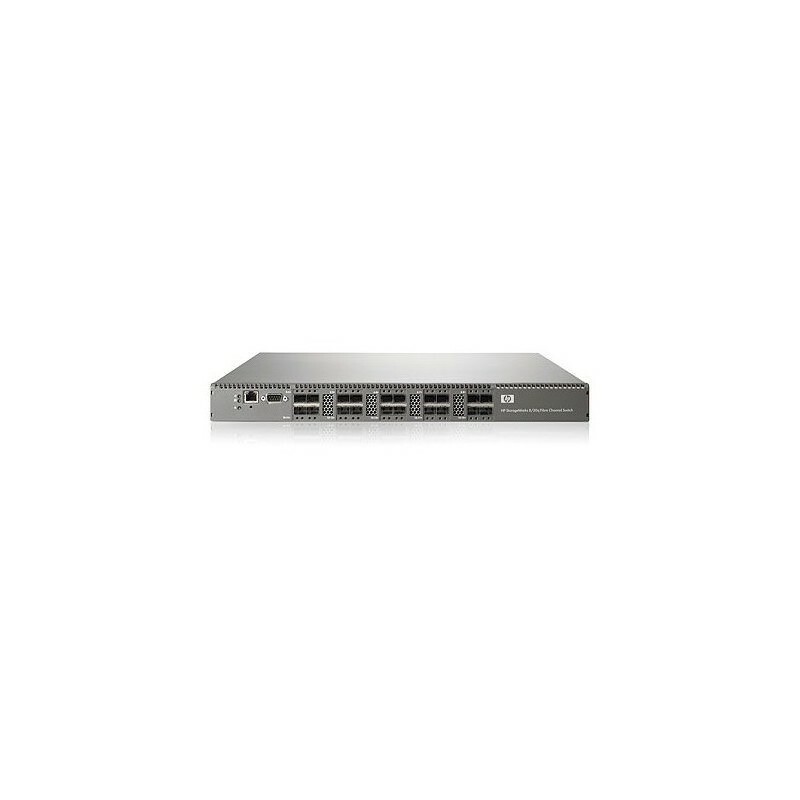 The 8/20q 8-port switch is HP’s lowest priced full fabric Fibre Channel switch. Your first SAN couldn't be a better value. The 8 Gb Simple SAN Connection Kit includes everything required for a 4-host SAN infrastructure, including 8 Gb HBAs, cables and SFPs--just add your choice of HP storage! Enterprise Fabric Management Suite (EFMS) delivers a comprehensive set of powerful, yet affordable, SAN fabric management tools for administrators to maximize application and storage performance and availability. SAN Connection Manager Software (SCM), included with H-series, lets you deploy SAN infrastructure (SN6000, EVA/MSA, HBAs) and provision storage from a single screen. Enterprise Fabric Management Suite Software delivers affordable SAN management tools such as performance monitoring and more. Start with an 8-port switch and as your needs change; simply expand via four-port license keys up to 20 ports per chassis. Then link additional switches to create a larger high-performance enterprise SAN of any topology. Although the 8Gb Simple SAN Connection portfolio delivers 8 Gb/s performance capabilities and a cross-platform GUI, it is priced competitively with 4 Gb/s switches. On a “cost per throughput” basis, its aggregate platform bandwidth of 340 Gb/s makes it the price/performance leader in the market. Whether your needs involve email/database scalability, server/storage consolidation or automated backup/disaster recovery, an HP 8/20q Fibre Channel Switch can provide accelerated ROI for your company. Inexpensively add a new department or remote SAN and seamlessly connect to existing HP B and C-series fabrics using Transparent Router (TR). TR eliminates the management challenges of interoperability and merged fabrics, allowing sharing of HP resources between separate SANs.